The truth is that I’m addicted to some things. ad·dict·ed – to become physiologically or psychologically dependent on a habit-forming substance. 1) COFFEE. Typical for the youth pastor trying to keep that crazy schedule of hanging out with students and leaders, healthy though?! I would think not…surely it can’t be healthy when one is addicted to a caffeinated, acidic, beverage of this sort. I know the headache at 1pm all too well – it hurts REALLY bad! This means I didn’t get my one mug fill for the morning…perhaps in another post I’ll talk about fighting addictions but for now I’m just confessing mine. Check out some stuff I found on us coffee drinkers, or even those of you who think drinking coffee is unhealthy! Overall, about 34% of those people say they need coffee to get through the workday. I’m victim of the 34%…the people who are addicted and get headaches early afternoon without their “fix” of the double shot espresso or venti mocha, I personally like my coffee with a little white mocha! 46% say they are less productive without it. While coffee was once considered bad for your health, it’s now thought to have many benefits besides simply jolting you awake in the morning. Heavy coffee drinkers may be half as likely to get diabetes as light drinkers or nondrinkers, perhaps because coffee may contain chemicals that lower blood sugar. Coffee might also help protect against cancer. Coffee drinkers are 50% less likely to get liver cancer than those who don’t drink it, and a few studies have found ties to lower rates of colon, breast, and rectal cancers among coffee enthusiasts. There is some evidence that coffee may protect men, but not women, against Parkinson’s disease. 2) SHOWER. I know this one may seem odd but it’s the truth. If I don’t get my shower in the morning I’m just not awake and ready for my day…it’s not the piping hot, well water that smells like sulfur and rotten eggs, nor my old spice body wash that does it for me. It’s my WATER PROOF BIBLE! Yup, believe it or not I do have a waterproof Bible I keep in the shower and have had it for over a year now. I’m addicted to it. Show this thing off at your small group, students love it! 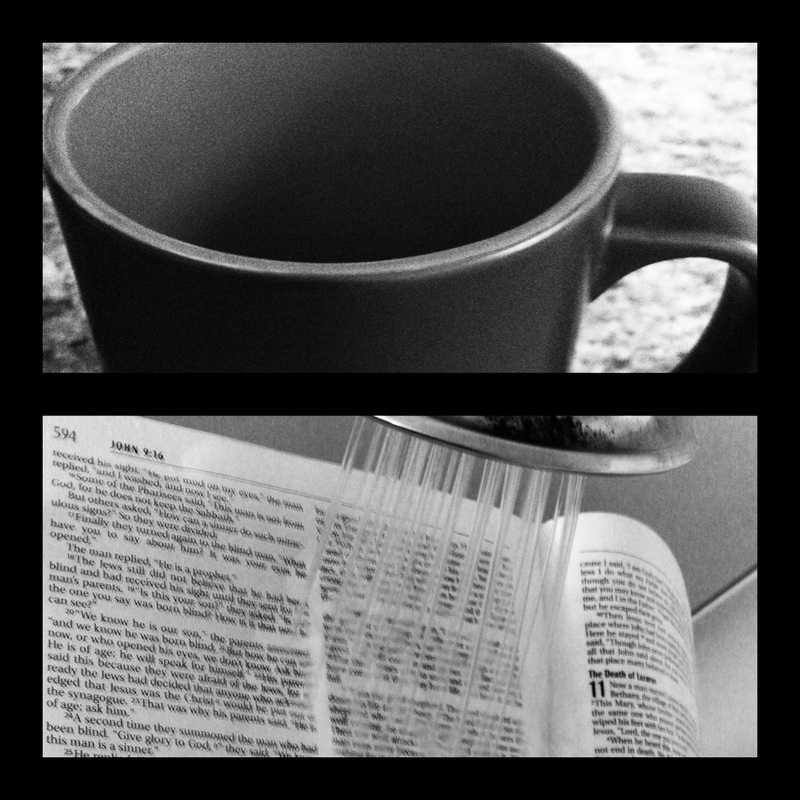 It does cause me to take longer showers, and highlighting my favorite verses doesn’t really work well, but it is one of the only places in life I can get away from it all…no phone, no computer, no TV, nothing…absolutely nothing, just me and the waterproof Bible. Being addicted to the Word is a good thing I suppose, without a little pep-talk with God my day seems empty and can quickly become about me rather than the one I serve. I have become dependent on it, the shower that is…I know it is the first thing I must do when I wake up. Okay okay, so sometimes I have my coffee first! Do you have a favorite place you connect with God?